If you're installing a heavier light fixture or a ceiling fan, you'll need to replace the electrical box in the ceiling with one that can support the extra weight. You also should replace a ceiling box if the existing one is loose or damaged. Having access to your attic is convenient when replacing an electrical box in the ceiling, but you also can do the work from inside your room, under the ceiling. It's important to know the weight of your new fixture when choosing an electrical box, but you don't need any special electrical knowledge to install the box. 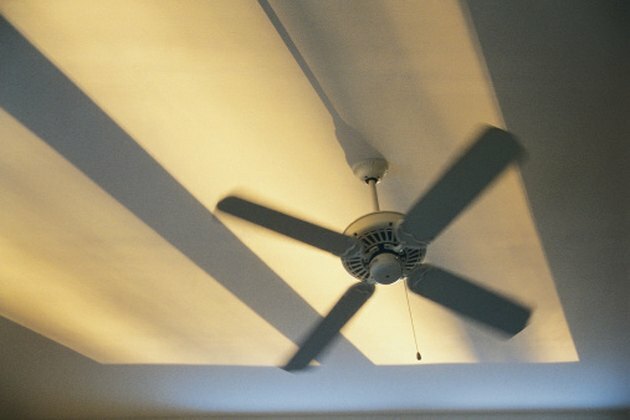 A ceiling fan requires a sturdier electrical box to support it. Turn off the breaker inside the main electrical panel that supplies electricity to the ceiling electrical box. Verify that all of the wires inside the box are turned off by touching them with a non-contact voltage tester. Go into the attic and located the ceiling box you want to replace. Pull the electrical cable from the box. If the cable is held in the box by a cable clamp, loosen the two screws with a screwdriver before you pull the cable out. Remove the box from the ceiling. Unfasten the screws if the box is held to the ceiling joist with screws. If the box is nailed to the joist, loosen the box by striking it with a hammer. If a bar hanger supports the box between two ceiling joists, cut through the bar with a hacksaw. Remove the box and pull the bars from the ceiling joists. Install a plastic replacement ceiling box that's rated for 50 pounds. Choose a box with nails integrated into the box if your ceiling opening is located next to a joist. Position the open edge of the electrical box flush with the ceiling side of the drywall. Drive the nails into the joist with a hammer. Install the ceiling box on an adjustable bar hanger if your ceiling opening is located between joists. Position the open edge of the electrical box flush with the ceiling side of the drywall. Place the end of the bar hanger against the ceiling joists. Strike the ends of the bar hanger with a hammer to drive the hanger's metal prongs into the joists. Drive nails or wood screws through the openings on the bar hanger ends for added support. Insert the electrical cable through a knockout hole in the back of the plastic electrical box. Turn the breaker on after you connect the fixture to the wires and secure it to the box. Turn off the breaker inside the main electrical panel that provides power to the ceiling electrical box. Verify that all of the wires inside the box are turned off by touching them with a non-contact voltage tester. Set up your stepladder underneath the ceiling electrical box you want to replace. Remove the screws holding the ceiling box, using a screwdriver. Pull the box carefully from the ceiling so you don't damage the wiring. If the box is nailed in the ceiling, place a piece of wood inside the box and strike it with a hammer to loosen the box. Pull the box carefully from the ceiling. If the box is supported by a bar hanger, remove the screws from the back of the electrical box that hold the box to the bar. Pull the box from the ceiling. Cut the bar with a hacksaw. Pull the bar hanger through the ceiling opening. Install a plastic "old-work" ceiling junction box if your fixture weighs 10 pounds or less. Pull the electrical cable that's hanging from the ceiling through a knockout hole in the back of the box. Push the box into the hole in the ceiling until the lip of the box is flush with the drywall. Turn the screws on the junction box clockwise to clamp it securely to the drywall. Install a remodel ceiling fan box for fans and light fixtures that weigh up to 70 pounds. Slip the hanger bar into the ceiling opening and hand-twist the bar until the ends touch the ceiling joists. Continue turning the bar clockwise with an adjustable wrench until the bar no longer turns. This indicates that the metal teeth of the hanger bar have securely gripped the ceiling joists. Place the U-bolt supplied with the remodel box over the hanger bar. Slip the electrical cable through a knockout in the box. Slip the bolt through the opening in the back of the box. Secure the box to the bar with the lock nuts provided with the box. Turn the breaker on to the circuit after you install a light fixture or ceiling fan.